Chocolate, chocolate, and chocolate are my most favorite foods. Of course when I found this recipe on The Pioneer Woman website I had to try them. And seriously, they are one of the best chocolate chip cookie recipes ever in the entire universe. I made them for our Sunday lunch with my family and the sister in law flipped. Yes, you absolutely must eat these with an ice cold glass of milk! Preheat oven to 350°F. Using a mixer, cream butter and sugar until fluffy, scraping the sides once. Add eggs one at a time, mixing after each addition. Mix in vanilla. 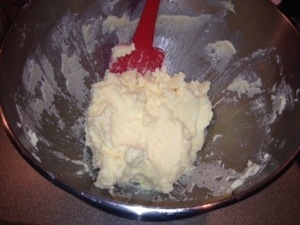 Sift together dry ingredients, then add in batches to the mixer, mixing until just combined after each addition. 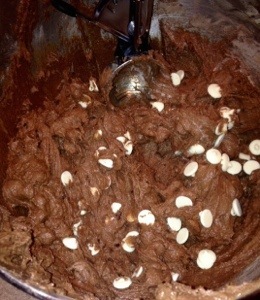 Gently blend in chocolate chips and white chocolate chips. 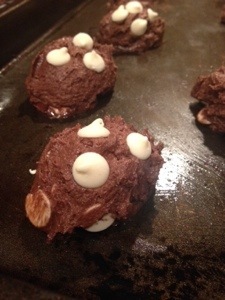 Using a cookie scoop, add 1 tablespoon portions to baking sheet. 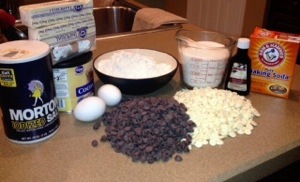 Dot the top of each cookie with 3 white chocolate chips if you’d like them to really show up on top. 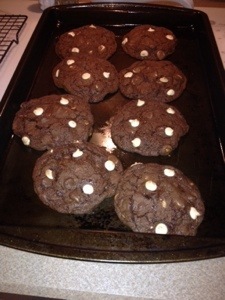 Bake for 9 to 11 minutes or until cookies are barely done but still soft and chewy. Let cool on a baking rack. Don’t forget your milk!! Ooey-gooey-licious!